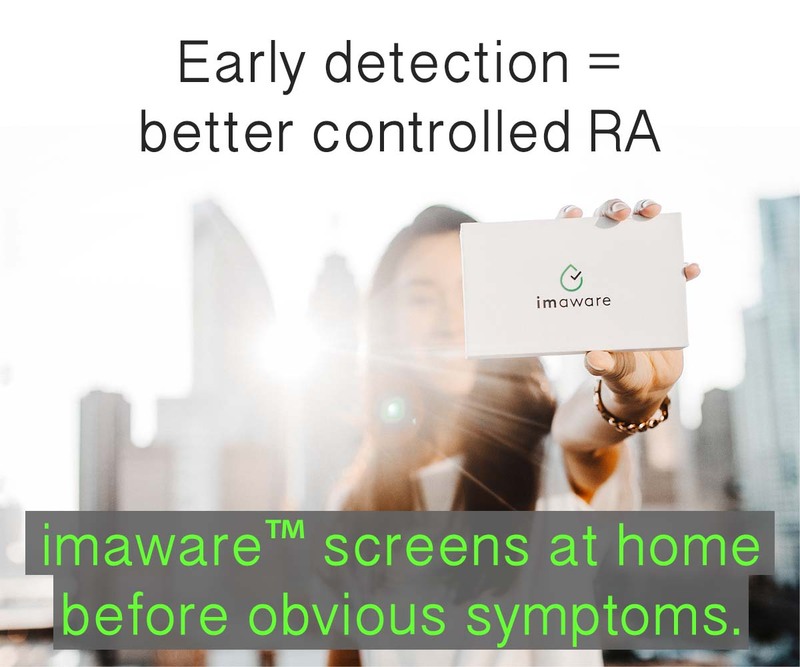 Do you ever wrestle with the disease aspect of rheumatoid disease (RD) – a systemic disease with joint symptoms? From what I’ve seen doctors, patients, care givers, and the public all struggle to grasp the systemic nature of the disease. We don’t want to see ourselves as sick, and that conveniently fits the public narrative that RD’s just a type of arthritis. We can go on sometimes, denying it’s actually a systemic disease with joint symptoms. And maybe we should, if we don’t see any problems. Do you ever think about yourself or those you care for having a systemic disease with joint symptoms? What do you do when the systemic disease with joint symptoms actually creates serious health problems? With the exception of some practical preventive care like immunizations, I think mostly I’ve looked the other way – like a proper ostrich. The onset of my full-blown RD* was accompanied by obvious systemic symptoms. Since then, I’ve had fevers, rashes, Sjögren’s syndrome, irregular blood pressure and heart rate, skin vasculitis, and fatigue at different times. But somehow I’ve been embarrassed to mention the systemic aspect of RD to doctors, friends or family. It feels like I’m being overly dramatic and I know everyone thinks so. No matter if I know systemic involvement is not rare because I’ve read the research. It still feels like I’m doing something wrong to claim that includes me. My ostrich ploy was interrupted this week. I finally saw the hematologist (blood doctor) I’ve been referred to since last summer. The doctor reviewed 8 months of irregular blood test results, including persistently increasing platelet levels, and my bleeding under the skin and though the skin without injury. Doc ordered more tests but said it’s likely these are all due to the “off the chart inflammation” of the RD. I was fine, not surprised. They were also wonderful to help me get a referral to a hepatologist (liver doctor) for a swollen liver found last month when I got an ultrasound for an enlarged spleen. I was fine with this news too, living with it day by day, with persistent rashes and swelling under my ribs. But what finally caught me was when I heard a medical assistant say my weight out loud. Replay from three weeks ago when my friends insisted I go to urgent care for cellulitis on my leg. The MA had announced my weight aloud. Down five pounds each time. I knew my clothes were too loose, but this news shocked me. I asked whether their scale was accurate, and they said yes, they use it themselves. For the first time, I didn’t feel embarrassed about being sick. I was fine, just scared. If we ignore the systemic aspects of RD, the truth might sneak up on us eventually. I wish we could wish it away. As much as anyone, even people with RD (PRD), pretends RD is not really a health problem, the truth remains. Even if RD is treated like a joint disease with systemic symptoms, it remains to be just the opposite: a systemic disease with joint symptoms. So the first problem is that PRD will have medical problems that need to be dealt with. The second problem is our recognition that we need to deal with it. But a third problem follows closely. PRD may have difficulty getting these medical concerns addressed, as we’ve experienced in our community. We remember the tragic example of Danita, a young woman whose death certainly seemed preventable if she would have been taken seriously. In contrast, Glenn Frey had access the most excellent medical care. Yet, it did not prevent Glenn’s death one year ago from complications of RD. 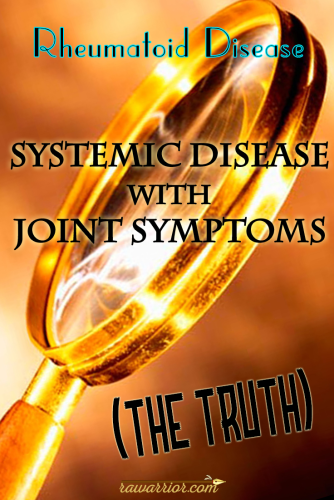 It’s ludicrous that a systemic disease with joint symptoms has been consistently mislabeled as the opposite, a joint disease with systemic symptoms. Let this become a battle cry of our movement. 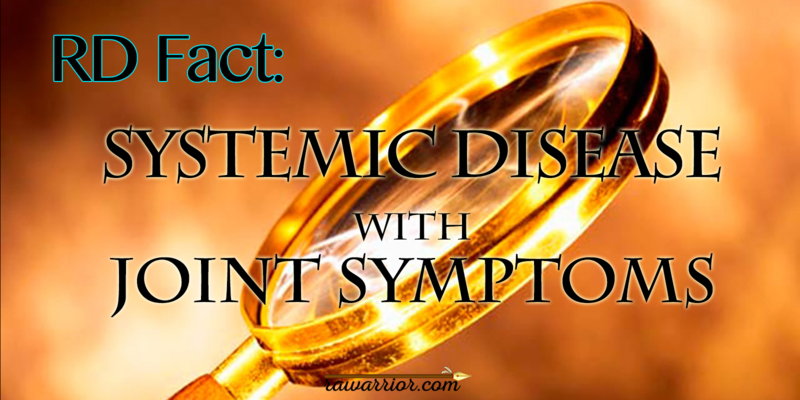 RD is not a joint disease with systemic symptoms; RD is a systemic disease with joint symptoms. 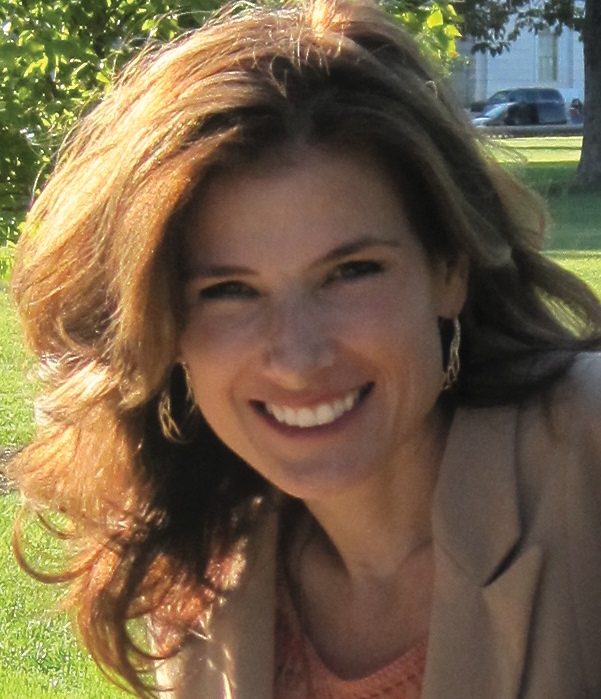 HAVE YOU RECOGNIZED THE SYSTEMIC NATURE OF RHEUMATOID DISEASE IN YOURSELF OR PRD YOU CARE FOR? HAVE YOU EVER STRUGGLED WITH THIS FACT? When I open the “Press Release”, only part of it can be seen. Systemic here! Diagnosed with Rheumatoid Lung one year ago. It was a total game changer. It is so hard to talk about the different symptoms we experience. Even so, I appreciate your encouragement to take it seriously. This is a serious disease! Yes I definitely have systemic features. My heart rate is high, my brain has been inflamed at one point. I’m also have autoimmume liver disease. I have had periods where I suddenly develop a heart murmur when inflammation levels go back down it goes away. The problem is Dr doesn’t want to add or change meds to lower inflammation while my heart is acting up and it takes a while to go down on its own. I also have had inflammation of my skin tissue under the surface, no rash but it just hurts to touch. Has anybody else experienced the skin issues? Yes Summer. You’re not alone. As for me, skin related issues – vasculitis (inflamed blood vessels), vitiligo (missing pigment), bright red rashes in the beginning, itching from side effects and liver problems, and finally bleeding under the skin. Did you go to the dermatologist? No I haven’t been to a dermatologist just went to my primary. She really listens and helps more than any of the other specialists I have been to. I also have had problems with my liver because of the meds. Didn’t realize the skin itching was part of that though thanks. I’ve tried to act “normal” for over 5 years while battling this disease but two weeks ago realised that’s no longer an option. 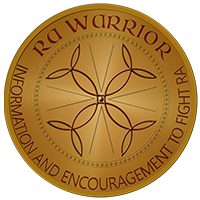 RA has caused so many problems with my lifestyle and body. I now have degenerative disc disease, bursitis and recently have developed fibromyalgia. Seriously enough is enough! I’ve delt with RD most of my life. Discovered accentdently,@52 I have Celiac. That in itself changed so much for the better!! As I write this, I’m 60, I’ve developed forefeet issuses,( learning to walk Barefoot all over again) head,neck, worse hand pain. I was searching for my newest symptoms because of my eyes, feet, & voice and discovered your site! Put the connections together. So I thank you for the time and effort! I have a hard time typing for a long time, so I do not know how you do it! So I thank you and commend you for that!! And I could write so much more but the reason besides thanking you, I really want to share this.. I had been self-medicating with THC Edibles and medicinal Vape oil for a long time. I had to quit 4 weeks ago. I now feel like I just want to die. And I really thought the issues I was searching for were separate. Wow, just wow. I know as soon as I can I am moving out of the state I live in. If I want to live a productive life. I know it was the medication I was giving myself that made it so I could do so much!! I stay very active no matter what. I have to! We are a self-funded fur kid shelter we have about 20 currently. I also am Nonna to 15 & 3 new great grandchildren. I have to keep going for them. It cannot be coincidence that I’m in this bad of shape in such a short amount of time. My knee even went out and collapse about 6 years ago I woke up one morning and couldn’t walk and never have had surgery. I fought my way through, even after seeing the orthopedic doctor. He is awesome. 🙂 He is about to retire though 🙁 I’m going to have to find another one. But I’m going to find that one in another state. I hate Pharmaceuticals I’ve been looking at all the meds all of you talked about. I do not want to deal with all the possible side effects. I do take all the over the counter nsaids, just alternately. Thank you for your time, please think about this.